The range of programs provides a colour coded flip book, consolidation work sheets and explicit letter formation tasks. Ideal for the skill rehearsal that is required in the early years. Designed by Speech Pathologists for teachers and parents. Simple to use. Card sets explicitly teach alphabet and phonic sounds. Students feel their mouth making the sounds. A body action is outlined for each sound. An effective and engaging way to teach alphabet and phonic sounds. Games and worksheets designed by Speech Pathologists and Occupational Therapists. The resource provides multiple opportunities to rehearse the recognition, application and letter formation of the alphabet sounds. Screening formats to track student performance on letter sound recognition and letter formation. Alphabet sounds & formation on the basis of scripted verbal cues.Representing the phonic and sound structure of words. Occupational therapy and speech pathology collaborated to create this resource. Designed for finger tracing and rainbow writing. Two levels of verbal formation cues. 26 x A4 colour double sided alphabet formation cards. 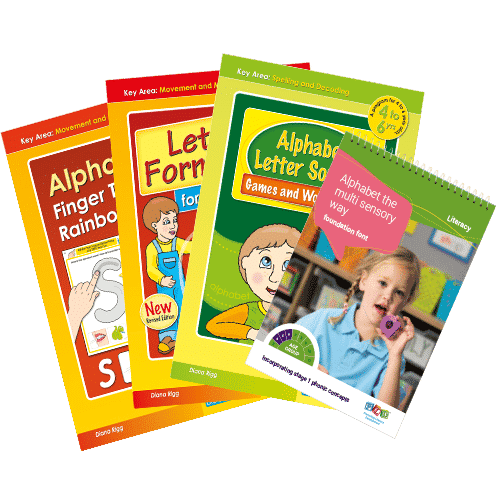 An early childhood approach to instructing letter formation.Developed by an Occupational Therapist, this easy-to-use resource contains an early childhood approach to developing positive letter formation skills. Additional information on pencil grip, posture, positioning of paper etc.